PH-F140SP's nine blades with MVB feature produce powerful yet silent downdraft airflow. With the UFB bearing, composed by MOSS and SSC systems, long lifespan and rotation stability are made possible. Composed by MOSS and SSC systems, Phanteks' UFB bearings have an effective hub-tip ratio to achieve a state of equilibrium reducing air and vibration noise. SSC provides an increase in the bearing's lifespan and ensures that the fan's axis is consistently operational and quiet. 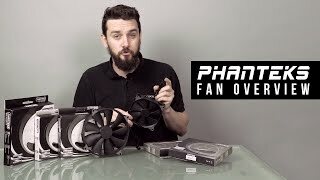 More links for "PH F140SP 140mm Fan White LED - Black / White"